When Bob Fish and Mary Roszel decided to open a coffee shop in East Lansing 15 years ago, many people wondered if it would be a profitable business endeavor. On Monday, Roszel and Fish proved their doubters wrong by celebrating Biggby Coffee’s 15th anniversary and offering free tall drinks to Biggby E-ward members at any participating store. In addition, a birthday party was held at the original Biggby shop at 270 W. Grand River Ave.
Roszel, Fish and several of their business partners attended the party, and customers could receive a free drink of any size from 8 a.m. to noon. 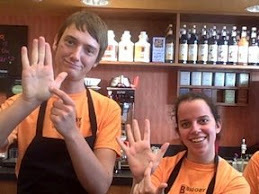 Customers went in and out of the original Biggby all morning to receive a free coffee and help celebrate the occasion. The turnout could not have been better, said Fish. 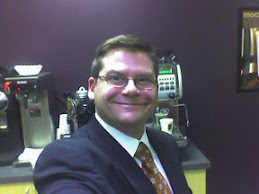 He was excited to see so many people he remembered from when Biggby first started. Roszel agreed that coming back to where it all began for Biggby was important to her, but her favorite part was showing those who doubted her that she knew what she was doing the whole time. “I never lost confidence that we would be successful, and it’s nice to come back and see those people that didn’t believe me again,” she said with a smile. Since opening in 1995, Biggby Coffee has expanded from one shop in East Lansing to 107 in five states. Although some coffee chains are forced to close shops, Biggby is opening three more in the next 45 days, Fish said. Fish attributes his company’s success and ability to reach the 15-year milestone to its simplicity. Along with making it easy for customers to order, Roszel said Biggby prides itself on customer service. She said the baristas at Biggby are taught to be friendly and get to know their customers. Ben Newman, a senior at East Lansing High School, said friendliness brings him to Biggby on a regular basis, and Biggby giving away free coffee to customers mirrors the coffee chain’s typical customer service. Free coffee? I went to my local Biggby and was told that they would not honor the free coffee birthday coupon because they were losing too much money! WOW, I can guarantee you that I will never be back to Biggby Coffee again. If you are not going to follow through or honor the coupon why have one in the first place. My loyalty lies with Starbucks where they are friendly and go out of their way to make sure that you are treated well. What great fun. Thanks Biggby for my free double tall Vanilla Bean. Quicken Loans Blog — Biggby Birthday Love !